Mathe Kuena Victoria Ntšekhe is the daughter of a mother from Lesotho and a father from Botswana. She regards Africa—without any boundaries—to be her home. 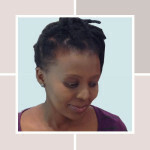 Mathe has a BSc in Mathematics and Computer Science from the National University of Lesotho, where she currently works at. She is particularly interested in Information and Communication Technologies for Development, known as “ICT4D”, which refers to the use of ICT in the fields of socioeconomic and international societal development. Within ICT4D, her research is focused on the development of an ICT solutions that can facilitate the use of indigenous knowledge (IK) as a resource in formal education, with the view to enhance learning for marginalized groups such as the rural poor.